Who were the artists of the Renaissance? Why do we still learn from Renaissance art? 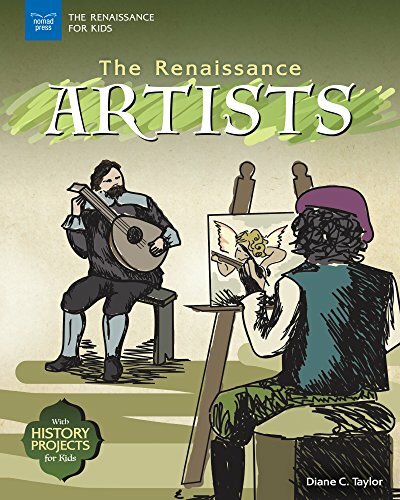 The Renaissance Artists with History Projects for Kids introduces readers ages 10 through 15 to the Italian Renaissance as it was experienced by five of the world’s most renowned artists: Sandro Botticelli, Leonardo da Vinci, Michelangelo, Raphael, and Titian. Kids learn about the biographies of these Renaissance artists through the perspective of three to four major works of art that not only defined that artist’s career but also created a cultural legacy that still resonates in the world today. Renaissance artists were not working and living in a vacuum! Instead, their work was informed by the cultural, historical, and political contexts of their time. Renaissance artists were required to serve lengthy apprenticeships in the busy studios of master artists, learning to make brushes, grind pigments, make fresh plaster, and draw. Plus, they had to maintain membership in guilds and keep in mind the pleasures and opinions of the wealthy patrons who funded their art. Being an artist involved much more than making art! The Renaissance Artists with History Projects for Kids is one of a set of four books in the Renaissance for Kids series. Other titles in the series are The Renaissance Inventors, The Renaissance Thinkers, and The Renaissance Explorers. Each book introduces five different people who lived and worked from the fourteenth to the seventeenth centuries and who made significant contributions to the wealth of human knowledge and experience. Hands-on STEAM activities that promote the scientific method or engineering design process, plus fun facts, primary source illustrations, and links to online resources, keep even the most curious kids satisfied! If you have any questions about this product by Nomad Press, contact us by completing and submitting the form below. If you are looking for a specif part number, please include it with your message. Sydney Travels to Florence: A Guide for Kids - Let's Go to Italy!